American urbanists like to criticize “the suburbs”, but this isn’t really fair. The suburbs are just a place, like South Dakota, or Australia, or Antarctica. They cannot change where they are.Some of this is a criticism of “suburbanites”. But so long as there is housing in the suburbs, and transportation to enable people to move, someone will live in the suburbs, at a higher or lower rent depending on people’s relative preferences for space or travel time.Some of this is a criticism of suburban politics. But this comes with self-selection, people want to live with people with similar preferences. The alternative is those with different political, religious, and athletic views live together, which would inevitably create more conflict.Some of this is a criticism of suburban travel behavior. But this is really due to suburban land uses and network patterns, discussed below, and demographics and socioeconomics which can’t really be changed or changed easily. Some of this is associated with land densities. Much of this is unfair as every place starts undeveloped and adds development over time, some places are more complete than others. Some of this complaint is legitimate in that particular subdivisions make intensification of development technically difficult and probably illegal under current zoning. But population densities dropped in central cities as well, both due to a hollowing out of individual houses as average household size dropped, and demolition of housing and replacement with lower density developments including more surface parking. Some of this is a criticism of suburban street patterns. But this is not inherently associated with the suburbs, it is really associated with an era. Streets that were built in certain periods had particular spacings, connectivity, widths, curvatures and so on. You can even see it in some urban brownfields that were redeveloped in this era (Energy Park comes to mind). Consider older towns, for instance county seats of suburban counties. While in the 19th century, they often had road, river, and rail connections with large cities, they were not in the daily metropolitan system, as people did not commute back and forth so regularly. Certainly residents of these places were affected by the nearby big city, but they were not at the time suburbs. These towns mostly have design coherence. Similarly look at areas that we call suburban developed before World War II, particularly first ring suburbs. These too often have design coherence. 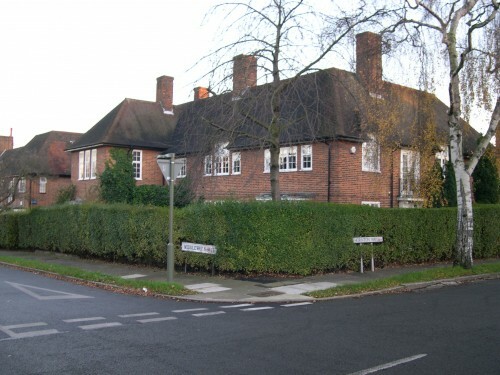 The photo shows an early Garden Suburb in London. If suburbs were more like this, I suspect the complaint level would decrease. The problem with the suburbs isn’t that they are not the city. The problem with the suburbs is the same problem as the city, they had a bad 5 or 6 decades of urban design. Cities in the same period saw urban renewal, mostly mediocre architecture, replacement of buildings with surface parking lots, and a general hollowing out. It’s not because it’s the city that this is a problem, it’s because there were some terrible design (planning, engineering) memes out there which got implemented as policy, while operating in a market that just had notaste. It is worse with the suburbs, as for many, those six decades of urban design were the only six decades of development they had, while for the city, at least the older street network remained mostly intact, as did some of the older commercial buildings and much of the housing stock. It’s not the now-assimilated suburbs built before the big cities reached out to envelop them within the daily metropolitan system. It’s not the older suburbs within the core cities, or the first ring suburbs adhering to the grid. It is a particular design of a particular era which enlarges distances between places in order to offer larger parcels of land on which to spend time and store cars.To reverse this, people will need to want to spend more time off-their property, bear more affinity for their neighbors, and promote changes to land use rules to enable such things (which will follow from consumer preferences). Technologies, policies, land uses, and transportation networks which reduce the demand for car ownership and car storage will facilitate this. Travel has peaked, many core cities are slowly gaining population, and perhaps population share, car ownership is down and car and bike sharing is up, new housing is being constructed in urban areas, and it seems if development is growing up faster than out. In short, the trends are favorable. They just have to run for 5 decades to undo the problems remaining. Reblogged this on Andrew Reker.